For business owners who wish to excel in every venture they set their sights on, Hostwinds offers the best platform to get started. There are several packages to choose from namely reseller hosting, WordPress, cloud, dedicated, and VPS (Virtual Private Server). Big businesses, as well as mom-and-shop outlets, can make use of the feature-packed offerings to generate more revenue. For only $4.50, the Basic plan offers you more services with lesser restrictions when compared to competitors. On face value, Hostwind gives basic information regarding plans without expounding too much. Experienced cloud hosting users can make out the details right away, allowing them to get exactly what they are after. If you are just starting out, the helpful customer service personnel will walk you through the process flawlessly. The plans comparison table is easy to follow and execute commands. From the onset, Hostwinds offers you the Advanced Website Monitoring add-on. Tracking your website’s progress is now intricately easy. Should your site fail to load or goes offline, this monitoring add-on alerts support and the issue is resolved before you even know! With an easy to use and flexible platform, Hostwinds avails more payment options than other services providers, including cryptocurrencies. Once the invoice comes up, you are ready to go. This Linux-based hosting plan is among the most attractive and comes to you in three flavors; Ultimate, Advanced, and Basic. Subscribers receive a free and dedicated IP address, unlimited storage, and unlimited monthly data transfers. Starting at $3.74/mo, the basic plan can handle 1 domain without straining the least bit. Ultimate tops off at $6.74 pm and allows you to host as many domain names as you please. The latter is the best to go with, seeing as it gives you unlimited room for growing your websites and businesses. However, the advanced plan costs $5.24/mo allowing upto 4 domains alongside unlimited storage and bandwidth. If you are after more customization for your websites, this options brings you Windows and Linux based dedicated servers. At $80.25 per month, this package is fully equipped to allow you limitless creativity. Your configuration not only determines the price but also how many features you will make use of. Configurable servers can be outfitted with storages of up to 1TB for every drive bay; you can use up to four drives at most. You can choose unlimited monthly bandwidth with any package and customize everything as per your needs such storage, ram, OS type, etc. with a few clicks. There are more than 10 plans to choose from comes with different server configurations. Without a doubt, WordPress ranks as the most sought after hosting for both personal and business uses. Content building and management are made incredibly easy with a host of customizable features and plugins. Installing your WordPress site on Hostwind’s servers happens without a hassle, with plans starting at $3.74/mo. The top tier plan is abundant with unlimited features and consequently, opportunities for business growth. Once you are done setting up, the site will run almost autonomously without requiring much input and effort. The more expensive plans assure you of significantly better results. There shared and WordPress hosting plans are similar in term of prices and specs. With several offerings to go including SSD Windows VPS, Budget VPS, SSD Linux VPS, and Premium VPS. There are different tiers to select from, each offering more or fewer features. While some go for $7.49, other cost you $47.24/month (managed Windows VPS), money well spent. The flexibility and power of all VPS plans is merely unmatched, setting you far ahead of the competition. In web hosting, having a private server is crucial especially when you have hundreds of thousands of visitors flocking to your sites. A high-end tier allows a limited number of people to be hosted, meaning more cooperation and growth opportunities for your business. Currently, they are providing managed and unmanaged servers for both Windows and Linux OS. Before getting into the web hosting niche, it is essential to decide whether your time is best spent dealing with server management. There are multiple infrastructures and a steep learning curve, all which work against your success. Their excellent reseller packages are engineered to establish you as a prominent market player, even with little knowledge. It is incredibly easy for you to rent server space from leading players before reselling it to your clients at a profit. For as low as $17.50/month, Hostwinds accords you limitless features to extend to your customers but a maximum of 10 cPanel accounts. 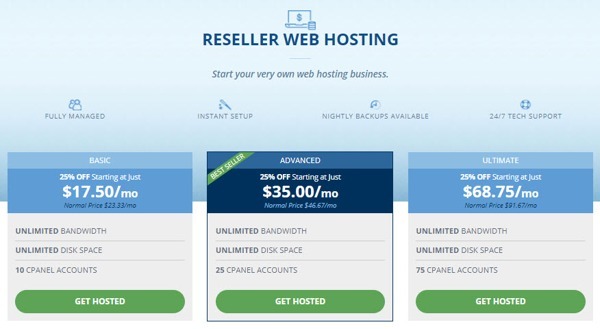 Available in both Windows and Linux varieties, reseller hosting brings on board both VPS and dedicated packages. For a business to be successful online, creating a database instance is an inevitability. A successful cloud hosting network is fostered Hostwinds, keeping your files secure and accessible from anywhere. Users can now select between pre-built applications and a specific Operating System, whichever works best. To offer you excellent services, the service provider request to know your location and apply the best utilities available there. You can choose between monthly or hourly billing options, both coming at competitive prices. To allow you absolute peace of mind to concentrate on the most demanding tasks, full management of your cloud platform is available. The ultimate storage methods, HDD and SSD, are now firmly within your grasp. All the extra security needed by your website is presented to you in a neat package. Server communication remains one of the most crucial encrypted features. If one instance threatens to put dampen you, don’t be bogged down; they can be resized instantly and to absolute perfection. As this happens, a consistent uptime is maintained, with site visitors experiencing no lags. As is with any business, accidents which lead to loss of valuable resources (in this case data) may happen. Stored data and saved information will never go missing, thanks to the scheduled backups happening every other moment. For every instance, you can now enjoy mind-boggling speeds topping out at 1Gbps. Through optimization, this service maps out the automated route with the least latency connections. The ultimate protection, guarding your website against all perceivable intrusions, is now tenable. Web hosting would be a mirage without stringent and impenetrable security measures. Hostwinds provides incredible data centers, complete with firewall services of the highest quality. Your website relies on this security to thrive and secure all revenue generated through it. All the vital information appearing on your site has to be guarded at all costs; otherwise, your competitors might use it to outsmart you. HostWinds assures you of a foolproof database replete with security counterchecks. Unlike any other service, the object storage lets you store data as blocks and objects. High-functioning volumes serve as block storing devices, opening avenues for all formats perceivable. Partitioning in storage can be executed as per your needs. There is virtually no limit to the amount of volume one can add freely. Across all packages, HostWinds offers you with Trendy Tools for setting up custom websites within no time. From the dozens of template and themes, you can then remodel into exactly what you have in mind. This tool first prompts you into keying in the site name; an HTML5-powered builder is then used for dragging and dropping content, images, and videos. From the multiple site-construction options, you can create highly engaging sites without outsourcing. While at it, feel free to tag along with own code, designed to offer specific services. A more custom look is not only inviting but also helps create a recognizable identity. In the Softaculous library, you will find the intuitive Magento ecommerce app. It is highly refined to help generate an irresistibly attractive store. A review gives you an in-depth understanding of how it can be best utilized. The open-source shopping cart is used beside add-ons to increase productivity and conversion rate. Advanced web monitoring also available for only a fraction of the price. For an extra $5.00, your information will be protected from all prying eyes, a small price to pay for investment security. Your address and name won’t appear in the Whois Registry. Uptime is the most important thing after hosting speed, your apps or website should be available round the clock. Once clients and associates fail to find you online, they will gradually lose trust and eventually take their business everywhere. Hostwinds remains highly dependable, with a proven 99.9% uptime guarantee. You can set up a tracking tester to check the service provider’s consistency at periodic intervals. After testing Hostwinds server’s uptime for a while, I found that their shared plans are capable enough of delivering acceptable uptime. Apart from all above benefits and hosting features, another major perk of using Hostwinds is an extended 60-day money back guarantee. So, you can use their platform and services for a whole two months. If found unsatisfied, just ask for the refund. Where most of the hosts like Siteground and Bluehost offer 30-day refund policy. From its initial review, Hostwinds has only become better with each upgrade. The impeccable customer service is undoubtedly the most significant driving force. As a result, the client base has now grown into a strong-knit family keen on sharing ideas. 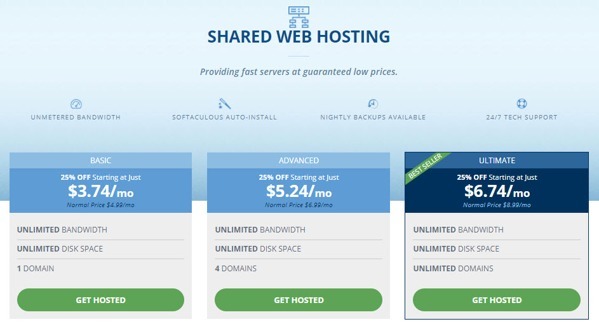 The attractive prices notwithstanding, this reputable web hosting provider ranks alongside big names in the industry like BlueHost and DreamHost. Instead of heavy advertisement compared to competitors, Hostwinds invest that money in improving their infrastructure hence deliver incredible performance for all type of hosting packages ranging from shared to dedicated. I hope this Hostwinds review will surely help you decide whether to choose it or not, however, if you need further help, please don’t hesitate to ask in the comment section below.